Only you have the guts, guns, and flying feet to stop them! 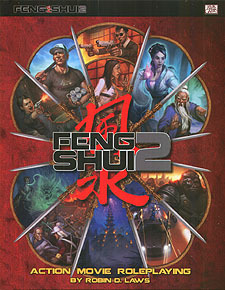 It’s back in all its explodey, chi-blasting glory — Feng Shui, the classic game of Hong Kong–inspired cinematic action — refurbished with a fresh bag full of ammo for a new roleplaying generation! Original designer Robin D. Laws rushes your way on a bullet-riddled gurney to serve up the thrills fans remember, furiouser and faster than ever. Choose between 36 action flick archetypes. Be an icy-cool killer, a determined martial artist, a maverick cop, a crusty old master, a clanking cyborg, a highway ronin, or a melancholy ghost. Fight with free-flowing bravura! Take out mooks, foes and bosses with guns, fu, magic, creature powers or the genetic mutations of a blasted future. Deploy smarts and skill to find your next fight!